We reviewed all the above Original 9Bar, Nutty 9Bar, Pumpkin 9Bar, Flax 9Bar and th Organic 9Bar. Below are a few paragraphs explaining the different kinds of Bars available to you. It's a bar for when you are on the run, before or after a sporting exercise, after a manic day, or just for a healthy and very tasty snack, the list is endless. The taste of these bars are delicious and lets face it that is the most important thing, they might do us lots of good but if they taste terrible we are not going to eat them. The texture is just so yummy it's had to discribe. I was so fed up when we had consumed our last one. This is my number one snack bar, keep up the good work 9-Bar I will look forward hopefully to tasting some more of your products very soon. 9Bar has a distinct flavour created from a unique mix of seeds and enhanced with a carob topping. The basis of all 9Bar’s are Sunflower seeds but 9Bar’s celebrity seed is Hemp. 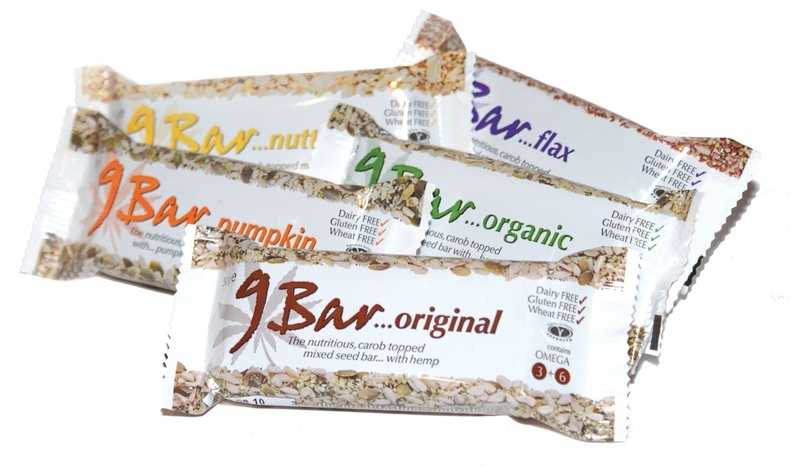 The Original 9bar is one of a kind with an individually delicious taste, packed with nutritional goodness. More than 57% of an Original 9bar is seeds, with a richly thick carob layer accounting for another 15%. The Nutty 9Bar is the chunky offspring of the Original. It contains a unique mix of nuts and seeds giving it a well, more nutty taste! A Nutty 9Bar contains around 31% seeds and 27% nuts with the usual carob topping. A combination of flavours that blend together giving a deep, rich taste, stacked full of goodness. The Pumpkin 9Bar is the girlie of the group, it has a sweeter more delicate taste and without the carob you can see all those deliciously lush seeds, accounting for more than 68% of the content. Although seeds have similar nutritional properties they all have individual differences..